Buying furniture online should be easy and accessible, and it should be a constant discovery of new and beautiful things that inspire you. It was 2012, and I remember thinking to myself, "How is there not a single high-quality sofa that I like available online?" As an interior designer, I'm constantly looking for well-crafted, sustainably-sourced, and altogether gorgeous furniture and decor. After a while, I realized there was a major void for people like myself who were obsessed with great design yet couldn't find beautiful furniture that was readily available online. I thought there needed to be a curated online destination that provided easy access to well-made designer pieces. That’s when I decided to create Kathy Kuo Home. I started my career as a furniture designer for a luxury home company, so I have had the opportunity to travel to all corners of the world, visiting top manufacturers and skilled artisans. I saw firsthand the stunning craftsmanship that went into creating beautiful, quality designs—from exquisite rugs being hand woven and dyed in Nepal to artisans refurbishing centuries-old antiques in Paris to furniture being assembled by hand right here in the U.S. It was during those special moments that I came to learn and appreciate the incredible artistry that goes into exceptional, well-made designs, and I knew I wanted to provide access to this kind of furniture and decor to others. From the beginning, I made it my mission to offer the highest quality furnishings and truly distinctive designs that are elegant and timeless on Kathy Kuo Home. Today, we continue to source the best furniture and decor in a wide range of styles and price points so that it's easy for you to shop by your favorite look, no matter your budget. And I personally vet every item you’ll discover here for its quality and ensure it's made from durable, sustainable materials by manufacturers we love and trust. I follow the same simple philosophy now as I did when we first launched our site in 2012: Buying furniture online should be easy and accessible, and it should be a constant discovery of new and beautiful things that inspire you. On top of our impeccably designed furniture, I'm proud to have built a world-class customer service team that’s here to help you with all your questions and product needs. We’re here to help you create a home you love. I hope you stay awhile and have a look around! 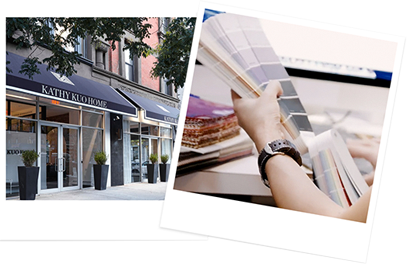 Our online interior designers and account managers can help you shop with confidence. With our Design Bar services, not only you will receive special discounts but also see how your new furniture will look in your home - before you buy! We offer 3D rendering services as well as 2D layouts to curate your room(s). Visit us in person next time you’re in NYC or contact us for a free phone consultation now!